Children's cold and snow clothing and gear. Hats, mittens, long underwear, snow suits, helmets, snowshoes, snowtubes. Discount LIFT TICKETS to The Canyons, Snowbird, Park City, over 40% off! K12 is a proud sponsor of the Rippin’ Rider Kids Testing Team. K12's mission is to provide any child the curriculum and tools to maximize success in life, regardless of geographic, financial, or demographic circumstance. For more on K12 see their website at K12.com. The Lange Junior Series was developed for the hottest young stars on the hill. This line incorporates all the technologies of adult boots while offering appropriate flex, sizing and performance characteristics for lighter skiers. For absolute control and technical performance. Highest level of technical performance for young skiers. Slightly softer flex, with technical high performance features. Built to meet the needs of young skiers by combining technical performance and comfort. Softer boot, with support needed to help kids ski better, faster. A soft-flexing boot with all the support and comfort of a higher-end model. Or visit Lange at langeskiboots.com. 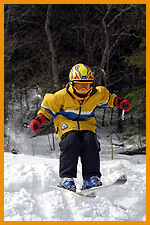 KidznSnow: Ollie in for Winter Family Fun! Copyright 1999-2019 Kidz n'Snow. All rights reserved.